New systems of governance are required to not only meet, but anticipate, the needs of a changing world. That was one of the messages Kofi Annan, the 7th Secretary General of the United Nations and Chair of the Kofi Annan Foundation gave to business leaders at IMD’s Orchestrating Winning Performance program. 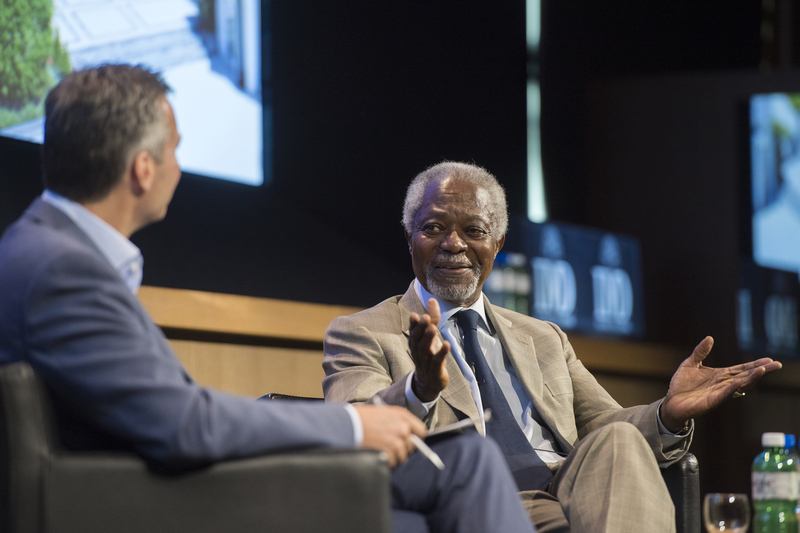 For the business leaders attending, Annan pointed out that the private sector has an important role to play in energizing politicians into action. Coming only four days after the Brexit, and in the thick of the US election campaign, Annan stood back from current events with the wisdom of an experienced diplomat, saying that the signs are on the walls, but no one is reading them. There is a pernicious disenchantment because people feel that they have been failed by their institutions, including the UN. The UN, he reminded, was created to address the geopolitical realities of 1945. “The world has changed and the UN needs to move on.” Annan does not attempt to hide his own frustration at not having been able, during his 10-year tenure from 1997 to 2006 (he stayed on for a second five-year term by popular demand), to transform the UN’s structure of governance. “Subsidies and privileges are the most difficult things to give up.” The UN Council is composed of five members with a right of veto, so it follows that the UN Council is not going to vote itself out of its own privileges. With 193 members, Annan is convinced that the Council is no longer representative. “Rather than destructive competition, we need to think in terms of participation,” he explained. During his entire career as appointed peace-maker, Annan, the Ghanaian-born 2001 Nobel Peace Prize laureate, has relied on civil society. Without the grass-roots forces of women and men who believe that change is possible, and necessary, resistances, including subsidies and privileges, will remain. Annan believes in the importance of empowerment to bring about reform. Annan is also convinced that the private sector can help contain corruption. “It’s easy to corrupt when governments dominate. Each time you need a paper, a hand comes up!” One of the best ways to fight the global phenomenon of corruption, he suggested, is to eliminate the red tape, which is more likely to happen in competitive conditions. The hour-long session was conducted by IMD Professor Mike Wade, who, after discussing the 1999 Global Compact Initiative and the 2000 Millennium Development Goals, both programs of which Annan is understandably proud, guided the speaker into revealing what he has done since he left the UN. He also shared some of his own strategies of success. Learn to listen carefully, he said. “Listen to what is said, but also to what is not said.” People can sometimes talk themselves into a solution. Get a good night’s sleep. “You need to know when you’re tired, otherwise you can make serious mistakes.” He admitted that he cannot function with less than 7 to 8 hours sleep a night. To end, referring to the situation of Europe following the Brexit vote, he reminded the audience that, remarkably, “the impact of peace never came up. The EU has been a triumph that no one thinks about. It is important for the other 27 nations to remain,” he hopefully concluded. Learn more about IMD’s Orchestrating Winning Performance program, offered November 2016 in Singapore.